This is one of those occasions you’d be wise to listen - and play - without prejudice. Thoughtful design offers effortless playability and upper-fret access. Sounds that run from bright and spanky to full-on aggression. The burl/burr finish is an acquired taste - that’s it. Once upon a time, there were three golden rules for builders of shred guitars. One: the whole guitar shalt not exceed the weight of a newborn Daddy Long Legs. Two: when it comes to the neck, anything thicker than a splinter shall be considered excessive. Three: thou must equip said beast with overwound humbuckers that would challenge the magnetic field of an exploded supernova. 30 years on from the original heyday of the shred machine, many of us still hold these clichés to be self-evident. In truth, though, modern rock, metal or shred guitars - however you like to pigeonhole them - are much more complex and diverse than their first-run ancestors. 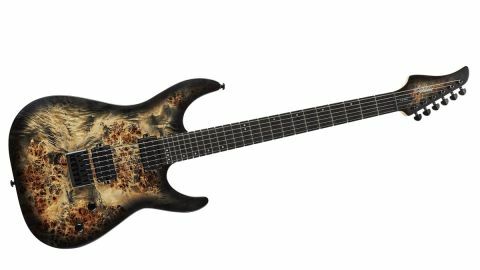 Fresh from the drawing board at Schecter HQ, the Indonesian-built C-6 Pro aims to knock those old prejudices on the head. For a start, the C-6 Pro tips the scales at around 3.5kg (7.7lb). That’s about the same as your average alder body Telecaster or Strat. Got it? This guitar won’t blow away if you leave a window open. Featuring an offset double cutaway mahogany body, the C-6 Pro comes with an eye-catching sculpted ‘burl’ top, better known in the UK as ‘burr’. This term refers to a wood that is riddled with deformities that are highlighted by our guitar’s glossy Charcoal Burst finish. Oddly, Schecter doesn’t tell us what the actual wood is. Anyway, depending on your point of view, the C-6 Pro’s top is like a dreamy gaze toward a distant cosmos; a satellite image of a beautiful mountain range; or a biopsy of a brain or lung under a microscope. a master volume, master tone and a three-way pickup selector lever switch. The metal-knobbed volume control also functions as a push/pull coil splitter for both pickups. The C-6 Pro’s three-piece bolt-on maple neck has a Fender-like 648mm (25.5-inch) scale length and is held fast to the body’s sculpted heel with five-screws. In classic rock/metal/shred guitar style, the wenge ’board has a flat 355mm (14-inch) radius and 24 extra-jumbo frets. The neck’s end of the deal is completed with small dot inlays, as-slippery-as-a-politician Black Tusq top nut, and six-on-a-side die-cast tuners. The C-6 delivers a super-low action and effortless string bending. Sculpting around the cutaways and neck heels also ensures that upper fret access is easy as pie. We’ve become conditioned to expect mid-range Schecters to come shipped with (Seymour) Duncan Designed pickups. Instead, we’re faced with the Diamond Decimators. Schecter produces some excellent high-end pickups, but these lower budget jobs are tasty, too. They remind us of the venerable SuperRock pups loaded into the popular Schecter PT model. They offer plenty of grunt yet they clean up nicely, too. Punchy and bright, the bridge unit impresses in humbucking and coil-split modes. The neck pickup has bags of clarity and wails beautifully when you offer up some overdrive and your best blues rock licks. There’s probably more chance of POTUS Donald Trump getting his face chiselled into the side of Mount Rushmore than the C-6 making the scene at a country gig. That’s not to say that it wouldn’t cut the mustard in such a scenario, but, let’s be honest, it has been typecast by its looks. Then there’s the feel. If you design guitars with skinny necks, fat frets and flatter than vintage fingerboard radii, it’s obvious you’re not trying to entice Joe Bonamassa away from his ’59 Les Pauls. We don’t doubt that this guitar will find the usual punters, but we think it’d be a shame if the rest of you judged it purely on looks. There are no skulls or other daft graphics. The flame maple and burl tops add a touch of class to the wolf in sheep’s clothing vibe. You can this model with a hardtail or Floyd, and the pickups are versatile enough to cover most styles. Anyway, the quest for a slim-necked guitar isn’t exclusive to the metal and shredder crowd. This is one of those occasions you’d be wise to listen - and play - without prejudice.